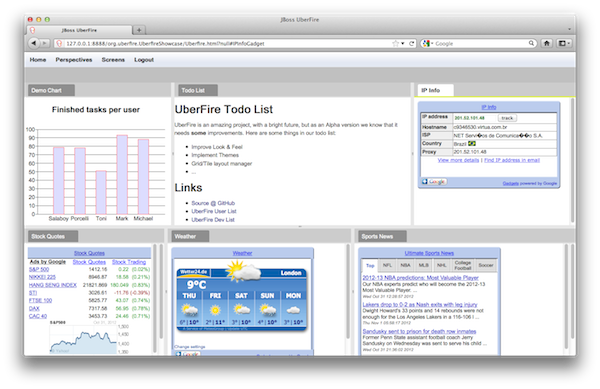 Today we're pleased to announce the first public release of UberFire, a web based workbench framework inspired by Eclipse Rich Client Platform. UberFire is a new independent project developed and maintained by Drool & jBPM team. 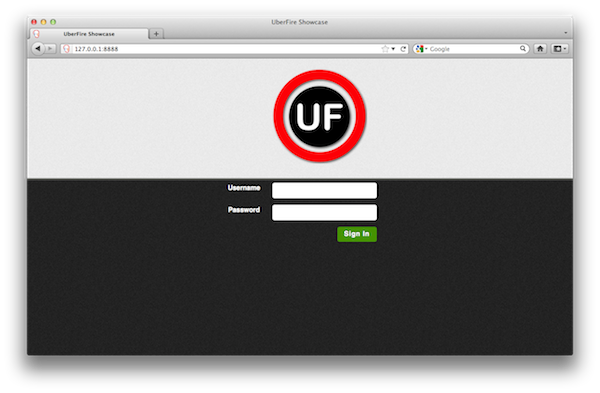 This is a very strategic project for us, once it's the base technology for our next generation of web tooling. One key aspect for UberFire is the compile time composition of plugins. Every plugin can be a maven module, when building a distribution, you simple add those maven modules as dependencies. Those plugins then become available a panels to be placed in perspective, via drag and drop, with docking. The clean and powerful design was made possible by GWT, Errai and CDI. 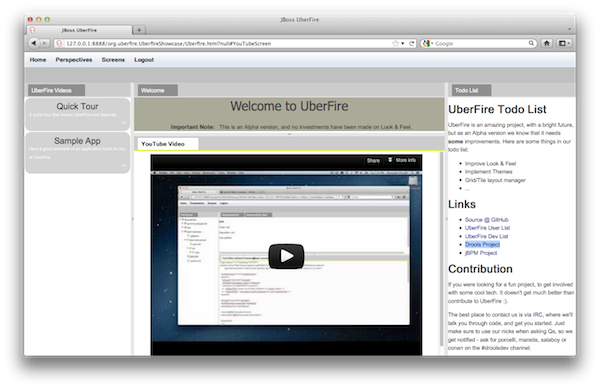 Other important aspect of UberFire APIs is the fact that you can use them for client or server side development. Please remember this is our first alpha release, expect bugs, unfinished features and we'll work on improving the look and feel over the coming months. 2. Home perspective with same panels including You Tube videos. 3. Selecting a new perspective. 4. Dashboard composed by some panels, including mounted Google gadgets. 5. Notice the "File explorer" any GIT repo can be created or cloned, with seamless server side storage. Also notice the context sensitive toolbar and menu bar entries, because the "File Explorer" panel has focus. 6. 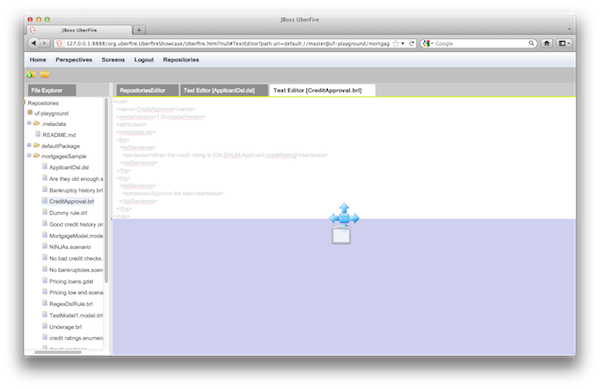 Markdown editor with live preview. 7. Panel drag and drop - The compass helps give visual indication for the drop zone. Panels can either be dropped onto the current panel, and added as a tab, or they can dragged to a new panel area, below it is added to the bottom. Important Note: No effort has yet been spent on its Look & Feel. There's nothing like believing in your own ideas than using them for your own work. Drools Guvnor is currently being ported to the UberFire framework. Anybody can experience the extent of our work so far by downloading the latest SNAPSHOT. 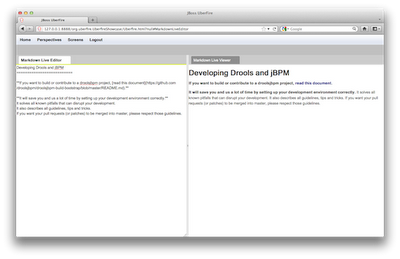 Furthermore the jBPM Console is also being ported to UberFire. UberFire is also a great opportunity if you're looking for make an Open Source contribution, as this is a very new project we have lot's of things to do. Click here to get some ideas for contributions. Get the latest artifacts from JBoss Nexus, or download our binary distribution direct from here. Try it out and give us some feed-back on our user list. It seems to be a great project. It can even be used as a framework to develop many applications. About Look & Feel I recommend integration with jquery ui themes. because currently there are many themes available for that and developers can use Theme Roller to create their own themes. Just one question: Since GWT supports RTL, Does UberFire support RTL direction too? "It can even be used as a framework to develop many applications." Absolutely, look at the video showing the human task rich client application. "Just one question: Since GWT supports RTL, Does UberFire support RTL direction too?" If GWT supports it, then UF either supports it or we can make it to support it. where can we look for the next release/feature related information?